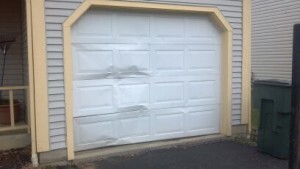 Rust: Rust is not only unsightly, but it is also a sign that your garage door will soon be experiencing operational problems if it isn’t already. Rust is a symptom of corrosion in a door’s metal parts, and these parts may break or fall apart unexpectedly resulting in inconvenience or even injury. Rust in spring coils is especially dangerous: since these coils are responsible for the high degree of tension necessary for proper door operations, if the coils fail the heavy door could fall and fall violently. Difficulty Opening: A door that is hard to open either by hand or automatically is exhibiting signs of wear or misalignment. Could it be your time to replace that garage door? This article was posted in Uncategorized and tagged curb appeal, garage door, Garage Door Maintenance, garage door repair, garage door replacement, Garage Door Safety, steel garage door, wood garage door. Bookmark the permalink.